More material means more option for the home decoration design, while don’t forget the collocation effect, it may also provide you surprise visual enjoyment. 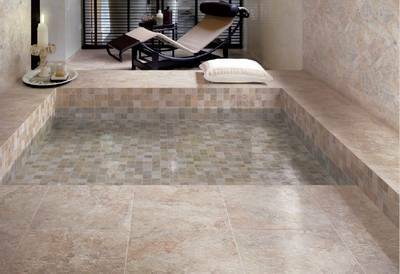 Well, here we would like to share the combination of Italian mosaic and tile . Look at the following image, with the larger 20" square beige stepping back and letting the steal the show. While there are tips for you when shopping for the tile: you could buy up. Why? I constantly rue the fact that a previous owner decided to save a few measly dollars by installing The Home Depot's "landlord special" tile in one of my bathrooms. It's worth pushing the top of your financial comfort zone when buying tile, because it's something you look and touch every day of your life.